Are your kids’ toys out of control in your home? Do you need ideas on how to arrange them so they don’t look so messy? 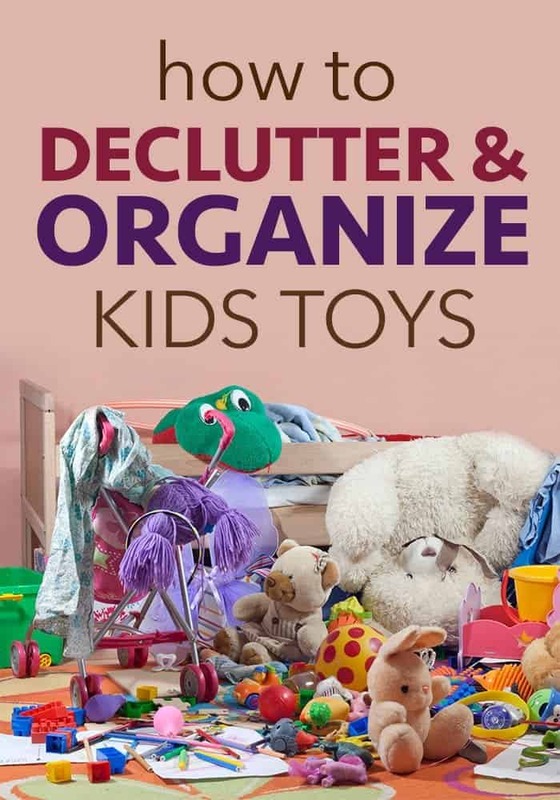 Here are some great tips on how to declutter and organize kids toys. Toys and kids go hand in hand. So, if you have kids, chances are you have toy clutter, too. Luckily, if you need to organize kids toys it is similar to organizing other areas of your home. The key to getting your toy clutter under control is maintaining your organizational system after it’s put into place. As you attempt to tackle the toy clutter in your home, consider these simple organizational tips. The first step to tackling toy clutter once and for all is decluttering your kid’s toys. Start by removing all the toys from around your home. If you have toys stored in different rooms throughout the house, go room by room to gather up all the toys. Lay out all the toys from the space in an open area, then start sorting through the toys into three piles: keep, donate, and throw away. Keep all the toys your children play with on a regular basis. Donate the toys that are still in good condition but don’t get used. And throw away all broken or old toys that your children don’t need anymore. After all the toys have been sorted, remove the donate and throw away piles from the room so you can focus on the toys that remain. Knowing what toys to keep and what to remove can be difficult at times. Before you start decluttering, pay attention to your children’s play habits for a few days. Take note of the types of toys they like to play with to ensure you don’t accidentally remove some of their favorite toys. Then, think about those toys as you work to declutter. In addition to considering the toys your kids play with often, it’s also a good idea to think about the toys that don’t get played with. Start by removing all the toys that aren’t age appropriate, like baby and toddler toys if you have older children. Next, throw away all the free plastic toys your kids have received from fast food meals or birthday favor bags. Finally, take a deep look at all the games and puzzles in your home and remove all boxes that are missing pieces to clear away any games that can’t be played anymore. The next step toward tackling toy clutter is to sort through all the toys you have left. Pick up each toy and create piles based on the category of toy it is. The type of categories you decide upon will depend on your kids and the toys they like to play with. Simply group different toys together based on the categories you decide upon until all the toys have been sorted into a pile. The best way to store your kid’s toys is in labeled bins. This is especially true if your kids are old enough to read the labels on their own. Simply create a label based on the categories you decided upon earlier, then place the label on a bin. Put the corresponding toys in the bin or basket to designate a place for each type of toy. Continue creating labels and baskets until each of the piles has its own storage container. Now that everything has a storage space, it’s time to find a place to put those bins and baskets around your house. To determine the best place to store your kid’s toys, think about where they play throughout your house. If your children enjoy playing in their bedrooms, store a selection of toys in their room. If your kids like to play in the family room, add a toy storage section to that room, too. In addition to picking the best locations in your house to store the toys, you’ll also need to consider storage solutions for each room. While you may not feel the need to hide your children’s toy bins in their rooms, you may want to camouflage the toys in other areas of your house. Decorative baskets, storage cabinets with doors, and storage ottomans are all great ways to store your kids’ toys in communal spaces, like the living room or family room. After taking the time to declutter and organize your family’s toys, the ball is in your kids’ court. Since they’ll be the ones playing with the toys, they should be at least partially responsible for maintaining their organization on a daily basis. 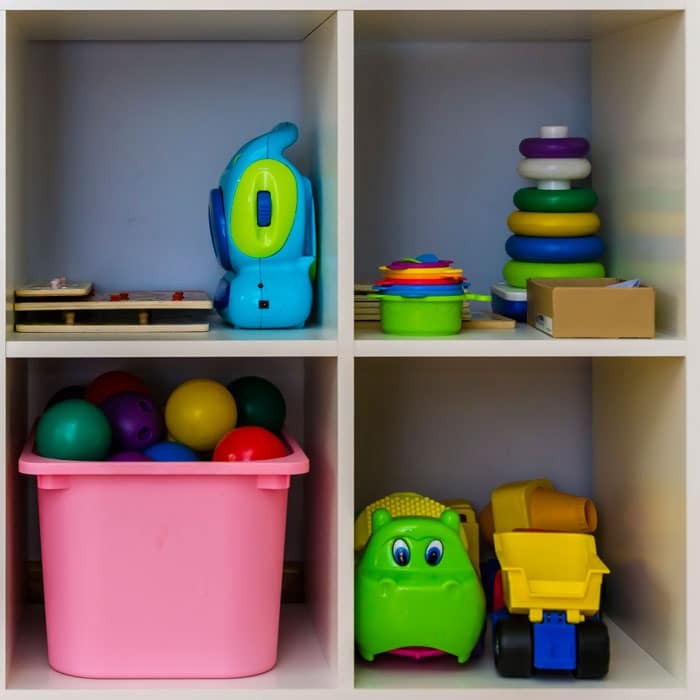 Show your kids how your organizational system works and tell them how important it is that the toys return to their designated spot after your kids are finished playing with them. To ensure your kid’s toys stay organized each day, implement a tidy-up time at the end of the day. Ask your kids to go around the house and gather up all the toys they left out during the day, then have them put each toy back in its proper spot.